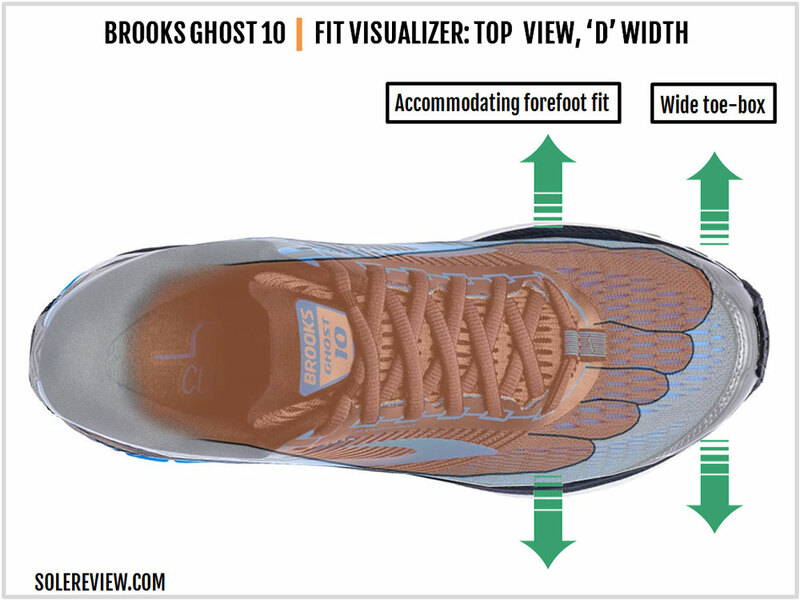 Brooks’ marketing pitch: The Ghost 10 delivers the smoothest ride possible for neutral runners. Upper: Mesh, fused and stitched synthetic leather. Midsole: Dual-density EVA foam midsole. 12 mm heel to toe drop. Widths available: 2A, B, D - (regular - men’s, wide - women’s), 2E - (wide-men’s). The Ghost 10 is an improvement over the 9. And why? 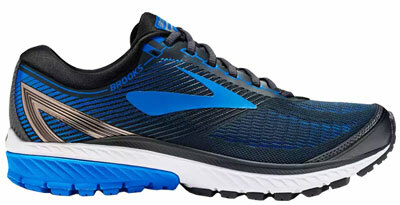 Brooks’s popular neutral trainer has increased toe-box room and breathes better. The cushioning is slightly softer too, a result of significant midsole design updates. 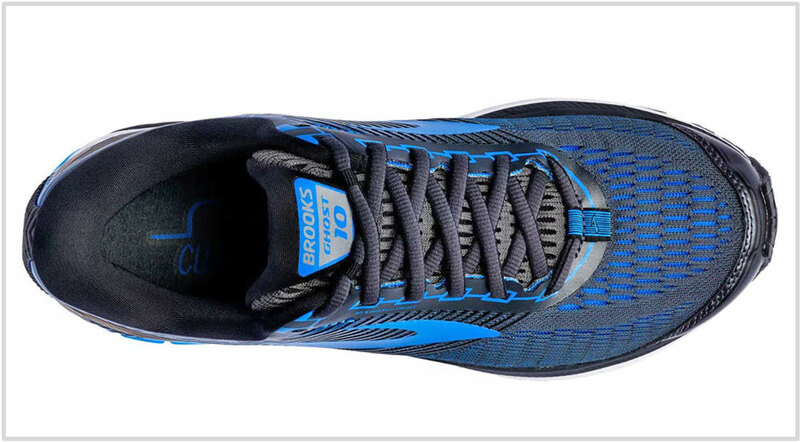 A few years ago, we were outraged when Brooks swapped its DNA Gel midsole for an all-foam one. The outrage wasn’t so much about the foam midsole per se; after all, brands change their cushioning technologies all the time. It was rather an issue of semantics. Brooks described the new ‘DNA’ foam the same way it did the Gel, and that, we thought, was somewhat misleading. But that was back in 2014, and the whole DNA foam-Gel thing is a non-issue now – at least from a marketing perspective. The all-foam Ghost has also grown on us over the past few years, based simply on the merit of the product. You see, the rest of the footwear industry is on a penny-pinching drive. Many of the new running shoes in the $110-130 price-band are stripped down versions of their former designs, relying heavily on a minimal design language and material specs to reduce manufacturing costs. This approach applies to some of the more expensive shoes too. Brooks’s design approach is a contrast; they continue to use shoe making materials which look and feel premium. Even though the Ghost 10 isn’t Brooks’s most expensive neutral shoe (the Glycerin is), it is heads and shoulders above the rest when it comes to the level of materials used. But will Brooks’s material generosity last for long? Can’t say for sure, but let’s enjoy this fleeting moment while we can. There’s also a consistency of upper fit and ride quality with the Ghost 10, and that makes the latter’s case as a versatile everyday neutral trainer very strong. The midsole doesn’t have the springy feedback of Boost or Everun, but there’s cushioning in plenty. The upper fits just right, being neither too snug nor excessively spacious. And what of changes between the Ghost 9 and 10? 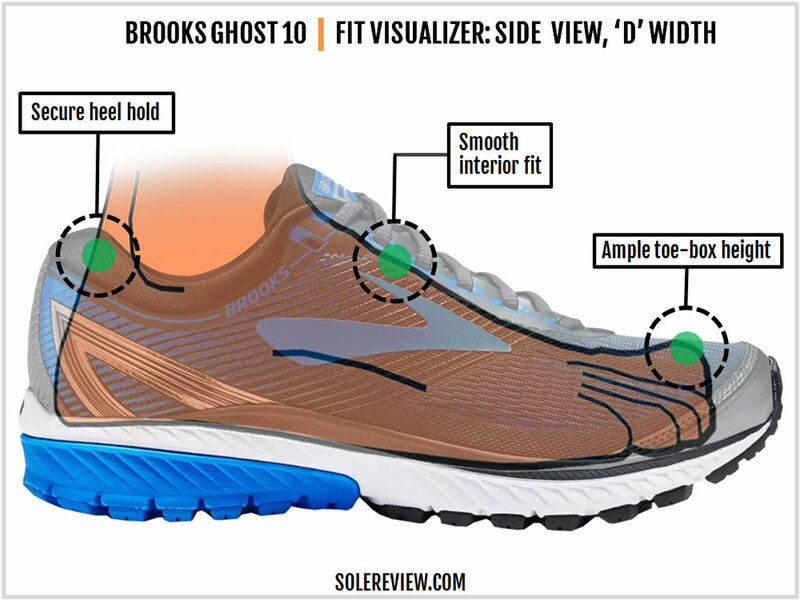 We’ll eventually cover this topic in greater detail as we always do, but the summary is that the new Ghost 10 comes with an increase in forefoot room, is more flexible, and happens to be a bit softer and lighter than the outgoing model. Most of the Ghost 10’s upper is made out of engineered mesh and high-density printed layers. The Brooks marketing name for this is 3D Stretch Print, a nod to the printing’s semi-elastic nature. The Stretch Print is applied over the mid and rearfoot, while the forefoot is built of engineered mesh. 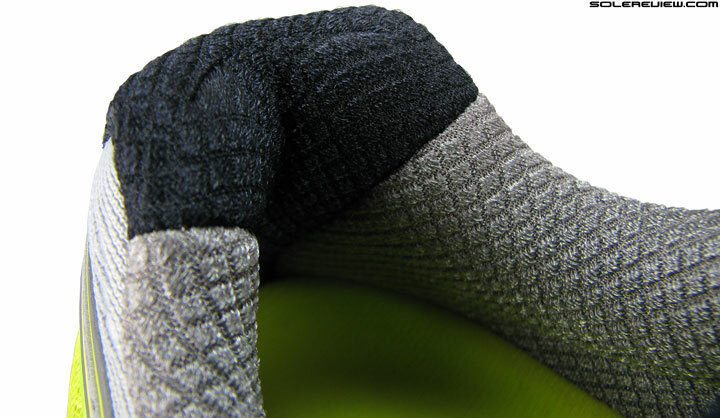 There are narrow bands of tightly-knit mesh areas near the midsole edge and over the forefoot, and in between are zones with larger pores for ventilation. The last year’s Ghost 9 had a fused toe-cap with a small ‘canopy’ extending over the big toe. That changes on the Ghost 10, which now uses a regular, stitched-on toe bumper. The Ghost 10’s forefoot gets an updated engineered mesh, and there’s reduced usage of the 3D Stretch print material over the sides. Needless to say, these updates affect the Ghost 10’s fit character – something which we’ll cover when discussing the upper fit later in this review. There are other design tweaks on the new Ghost, such as the updated (and cleaner) lacing area and the external heel area. The laces are round this year compared to the Ghost 9’s flat ones. 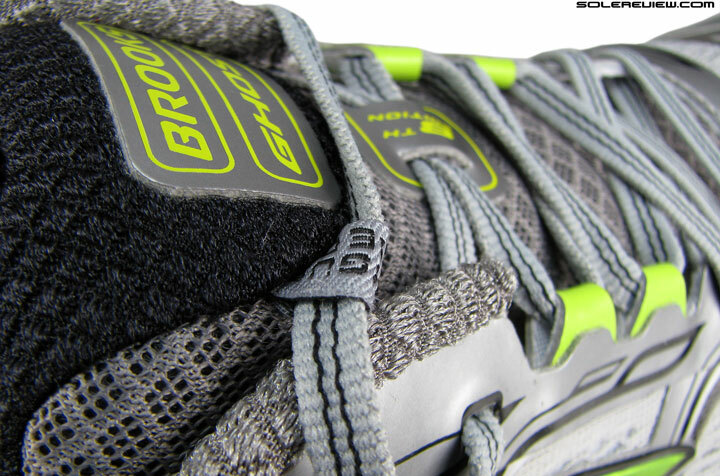 But regardless of their shape, Brooks’s laces are a soft and semi-stretchable kind, and they stay tied-down. So there’s little functional impact here; rather, it’s a matter of personal preference. The heel gets some bling in the form of molded urethane decorations colored in metallic. We say they’re decorative because the heel already has support due to the hard internal counter. Over the heel center, the synthetic strip of the Ghost 9 has been replaced with molded mesh. Reflectivity gets affected here, as they disappear along with the Ghost 9’s stitched synthetic. The small ‘DNA’ logo on the midsole and the tongue label are the only shiny bits the Ghost 10 have. For the last few years, Brooks had relied on a two-mesh set-up to construct the heel collar design. One kind of mesh lined up the Achilles area, while another formed the rest of the heel collar. That changes with the Ghost 10, which now uses only a single mesh to line the insides of the heel. Also, there’s more foam padding inside the heel over the Ghost 9, so the heel interiors feel smoother overall. The Ghost has never had an inner sleeve, but tongue slide was prevented by using a ‘tongue-tied’ loop. The Ghost 10 doesn’t have a sleeve either, but the tongue now has two loops instead of one. So the plushly padded tongue is securely held down by these loops, hence completely preventing tongue slide. The Ghost 10 is slightly lighter than its predecessor due to the elimination of layers; there’s a weight reduction of 0.3 ounces. 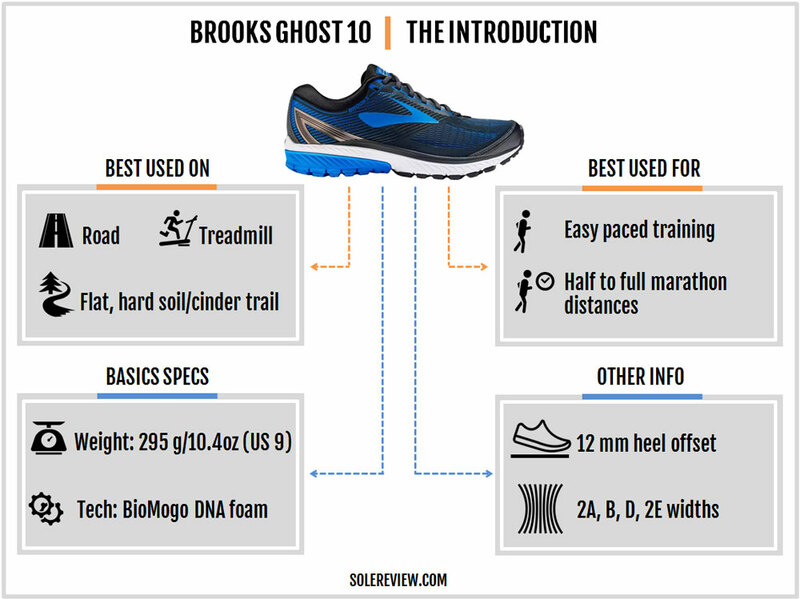 If you’ve been keeping up with the Brooks Ghost series, then you’ll know what we mean when we say that the Ghost 10 feels similar to the Ghost 7. The Ghost 7 was the first all-foam based model after the Gel-based Ghost 6, and it had a softer ride. 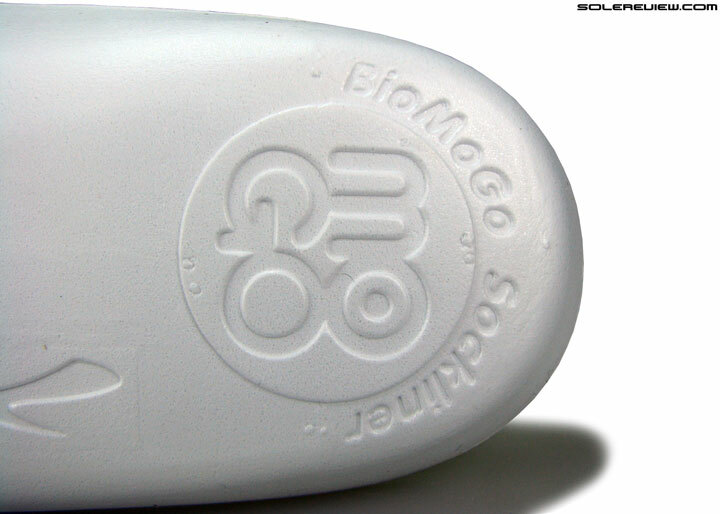 A similar analogy applies to the Ghost 10; the Ghost 8 and 9 were firmer riding models. 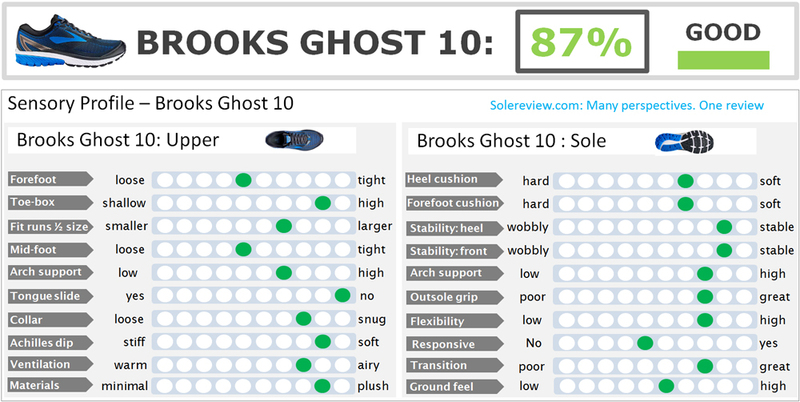 The Ghost 10’s midsole construction is similar to the Ghost 7 too, with a separate crash pad on both the midsole sides. In contrast, the outer/lateral midsole of the Ghost 9 had a single-density construction. These updates also mean that the Ghost 10’s forefoot midsole is now single density, as opposed to the twin-stack of the Ghost 9. The result is a noticeable increase in forefoot flexibility and softness over the last version. The design of the outsole flex grooves have little to do with the added flexibility; rather, this change is material and construction dependent. The midsole walls also flare higher on both sides of the midfoot. You can see the midsole sloping upwards from the forefoot to the midfoot, after which it melds into the rearfoot. The material hasn’t changed, however. 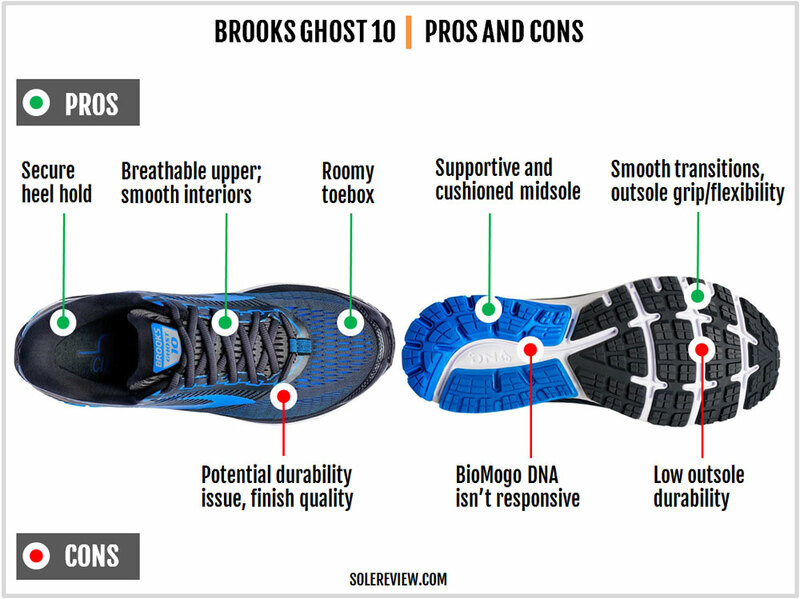 The foam continues to be Brooks’s Biomogo DNA EVA foam, and updates made to the construction and density ends up making the Ghost 10 a softer Ghost. If you’ve read our Glycerin 15 write-up, then you’ll recognize the common update theme applied to both. For example, a section of the foam midsole (under the midfoot) now swoops down to form a part of the outsole. This is so designed to soften the midfoot transition experience. Other design aspects are borrowed from the earlier Ghosts. The rounded heel outsole is split into two near the edge; this allows for smoother landings. There’s an open section of midsole foam right under the heel, and this splays wide during landings to produce a cushioning effect. The removable insole placed inside the upper hasn’t changed. 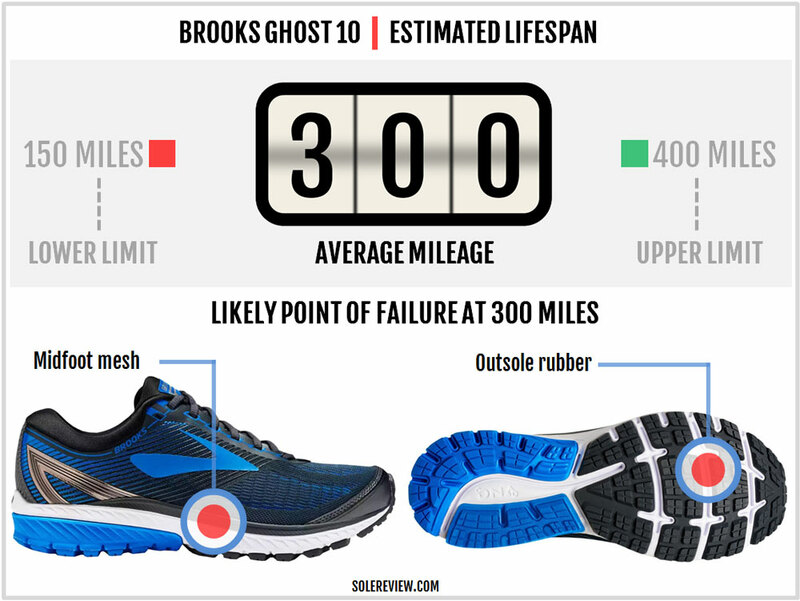 It is the same thick BioMogo foam sockliner used on the past versions of the Brooks Ghost. 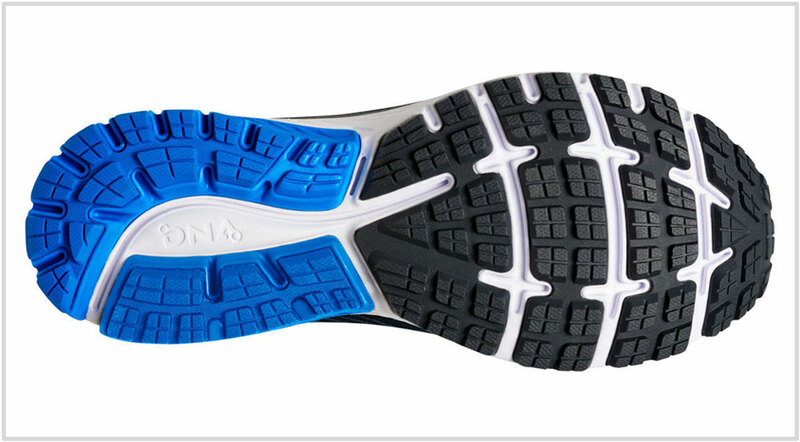 Like many Brooks shoes, the soft outsole rubber will be your primary durability concern. 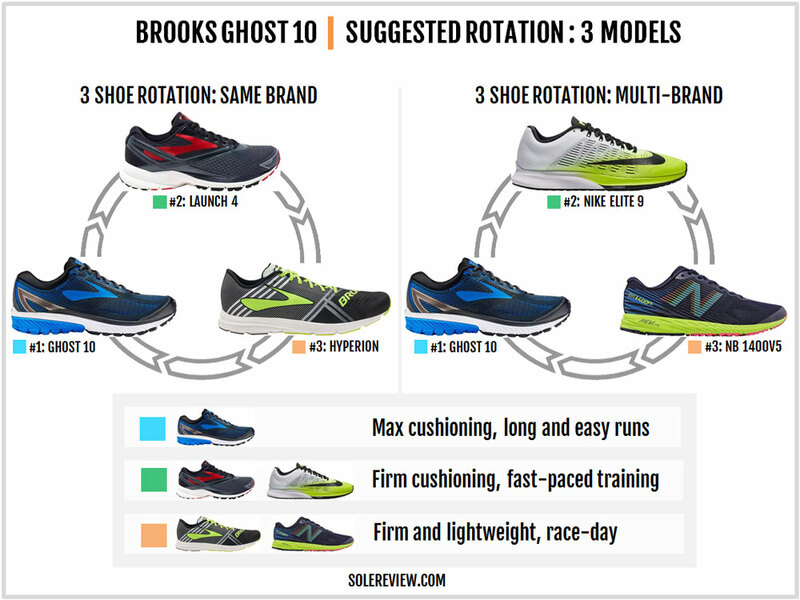 What Brooks giveth in outsole grip, it taketh in outsole lifespan. The rubber provides excellent grip, but has lower durability compared to its peers. Regardless of whether you’re a forefoot and rearfoot striker, the frontal section should be the first to shred. Another area you should keep an eye on is the forefoot mesh. Compared to the Ghost 9, most of the mesh in the front does not have external reinforcement; also, it feels thinner. Since the mesh is directly glued to the midsole, watch out for signs of early wear due to abrasion and repeated flexing. The Ghost 10’s midsole is noticeably more pliable than the Ghost 8 or 9, so that translates into an increased flexing action for the upper mesh. The Ghost 10’s upper fit is an improvement over the 9. The last year’s model had a larger, fused toe-bumper with an extension over the big toe. This made the toe-box relatively cramped, so the increased space in the Ghost 10 will come as a relief. By removing the 3D Stretch print in the forefoot and shortening the synthetic toe-bumper, the Ghost 10’s toe-box gains space – both vertically and sideways. The upper breathes better too, and has an accommodating nature. That said, the Ghost 10’s mesh isn’t as stretchable as the Glycerin 15’s. The insides have a smooth feel, as expected of an upper which is nearly free of stitched overlays. There’s no tongue slide, thanks to the dual loops, and the generous padding filters the lacing pressure. The heel collar has a smoother fit now. The switch from dual-mesh to a single mesh lining results in a more consistent feel, and there’s this sense of increased padding packed within. The rear upper grips extremely well. When new, the Ghost 10’s Achilles dip slopes inwards – more so than the Ghost 9 – and this leads to a temporary paucity of toe-box room, as the heel pushes the foot forward. But after a week or so, the heel padding settles in and makes the Ghost 10 fit true to size. So if you feel that the Ghost 10 is slightly shorter in size, this feeling should dissipate as you put on miles. Get the same size as the Ghost 9, or if you are new to the Ghost, then buy true to size. 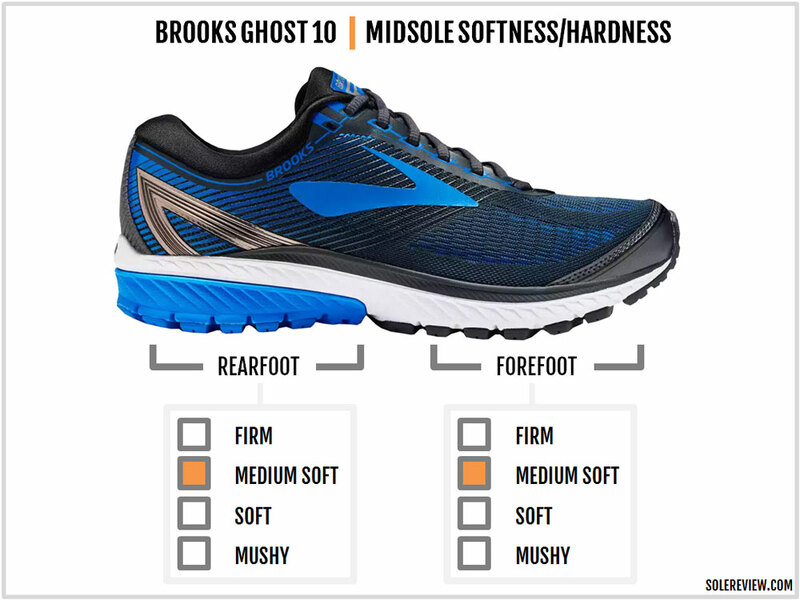 The Ghost 10’s ride represents an optimal meld of cushioning and support. There’s a distinct sense of softness underfoot, but it isn’t mushy either. But if you’re comparing the 10 to the 9, the newest Ghost is softer. This is because of two reasons. The first is the updated midsole with a separate crash pad under the heel. This also translates into a single density forefoot on the Ghost 10, which is different than the dual-density design of the Ghost 9. The second is the lighter density of the upper midsole foam itself, which is softer than before. Combine these updates, and you get a softer ride – both under the heel and the forefoot. While the cushioned insole inside the upper delivers an identical level of cushioning, the softened midsole foam changes the Ghost 10’s ride character. The forefoot is also softer, as the entire midsole thickness is constructed using a single density (and softer) foam. That said, the rearfoot doesn’t lack support. The crash pads in the lower midsole are firmer than the upper portion, and these structures keep the midsole stable. It is also important to highlight the higher arch flare of the Ghost 10’s midsole. This change in the sidewall design makes the shoe feel more supportive under the arch when compared to the Ghost 8 and 9. The transition quality is average, as the softer midsole tends to slow the down the loading process. This is particularly noticeable under the forefoot, where the softer and more flexible base makes the push-offs a bit lazier. 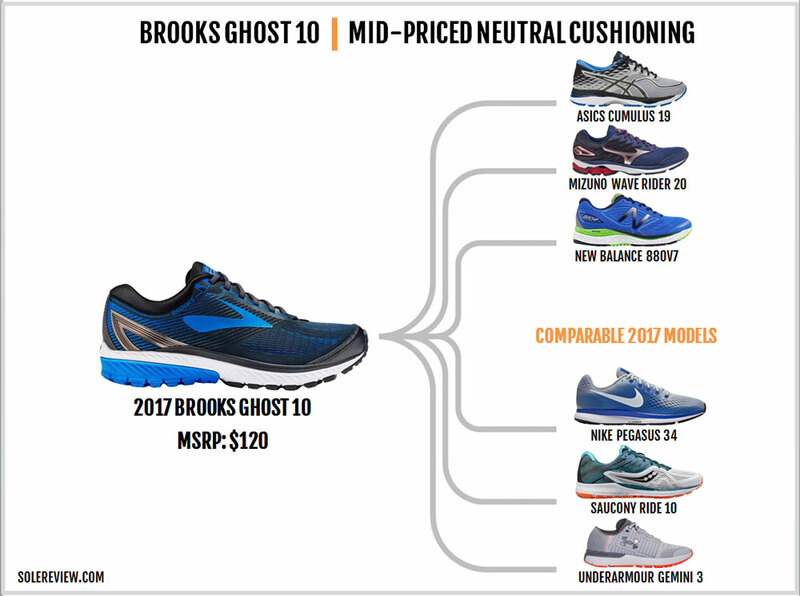 So depending on how you like your neutral trainer served, the Brooks Ghost 10’s added softness could be viewed as a double-edged sword. A softer midsole makes for a plusher ride experience, but at the same time, you’ll miss the rock-solid stability of the Ghost 8 and 9. Nonetheless, the Ghost 10 is a great neutral shoe for training runs of any distance. It has ample cushioning for a marathon, and stable enough for a quick treadmill run. It is just that you won’t get the bouncy responsiveness of foam technologies like the adidas Boost or Saucony Everun. The Ghost 10’s biggest strength is its versatility. The upper fit hits the sweet spot of interior space and secure hold, and the same applies to the balanced ride character. This versatility gives the Ghost multi-role capabilities, be it tackling marathons or the occasional training run. We like the use of premium materials in running shoes, a fast disappearing trend save for shoes such as the Glycerin, Ghost and a few Saucony products. There are no evident signs of cost cutting on the Ghost, and that translates into a running experience which feels worth every dollar of its $120 MSRP. Below, the outsole grips well, and the density consistency of the upper midsole and the BioMogo insole give the ride its characteristic smoothness. Now for the cons. The outsole durability has always been an issue, so the premium material package amounts to nothing when the underside tends to wear and tear faster than shoes from say, the adidas or Nike stable. And then there’s the staid plainness of the DNA foam material, which provides the expected (and ordinary) foam-based cushioning and nothing more. You’ll also have to live up with the blemishes and finishing defects in some examples of the Ghost 10. We’ve often highlighted this issue in our past reviews (G7 review), and some production models might have skewed assembly or glue marks. So visually inspect any Brooks shoe before you buy. A couple of things will stand out when comparing the Ghost 10 with the Ghost 9. The first is the softer ride quality which also includes a more flexible forefoot. Earlier in this review, we’ve already covered the reasons why this occurs. The second update is the increased space in the toe-box, the result of a redesigned toe-bumper and an open forefoot mesh construction. There are other minor changes such as the 0.3 ounces weight reduction, the increased under-arch support, and the updated heel area, but the ride softness and the toe-box space are the updates which matter the most. Spend $30 more, and you get the Glycerin 15. What’s the difference? The Glycerin has a plusher interior and a slightly more stretchable mesh, and the midsole is more supportive and cushioned. 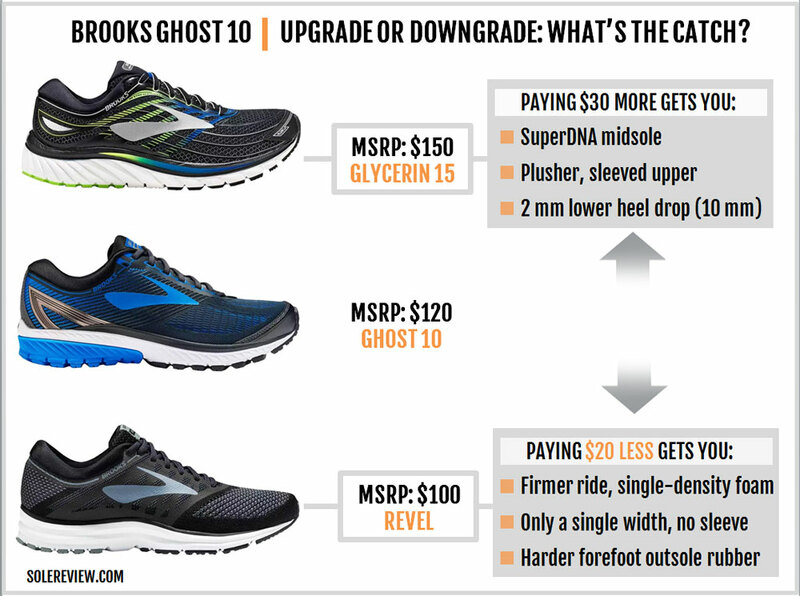 When compared to the Glycerin, the Ghost 10 feels a much lighter shoe, though the actual weight difference isn’t much. 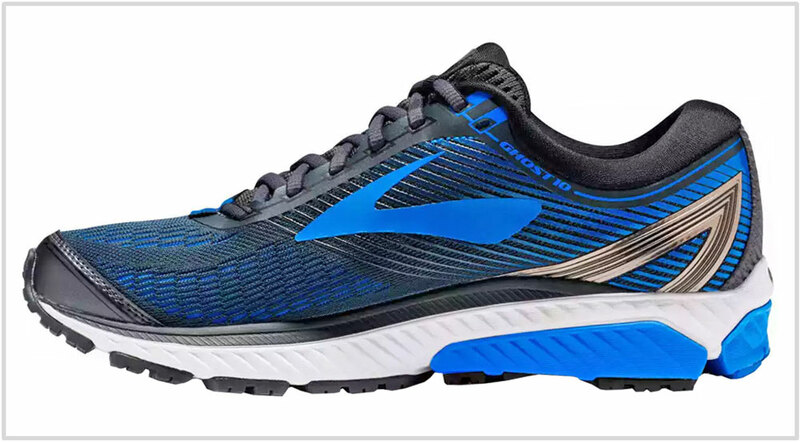 This is perhaps so because the Glycerin 15 feels relative bottom heavy, and there’s a sense of more midsole material than the flexible Ghost. At the entry level is the new Brooks Revel with its new knit upper and a single density midsole. Much like the Launch 4, there are no additional widths. The Ghost 10 is a comfortable and versatile shoe, but not very fast. So what do you do then, for faster training runs? You get the much firmer and snugger fitting Launch 4. And if you’re used to firm riding shoes, then the lighter Launch 4 can be used for longer races too. For shorter 5K and 10K races, the Brooks Hyperion is your go-to shoe. Now let’s explore some of the options available outside the Brooks assortment. The Hyperion equivalent would be the sleek New Balance 1400V5. It has a secure yet breathable fit, and there’s enough cushioning for shorter runs or races. For general fast-paced training runs, consider the firm riding Nike Zoom Elite with its snappy forefoot feel. There are various neutral trainers available in the same price class and category, but the New Balance 880V7 is the closest match with the Ghost 10. Much like the Brooks shoe, the 880V7 has a regular dual-density EVA foam midsole with similar support and cushioning levels. The upper, with its engineered mesh and fused overlays, partly resembles the Ghost – except for the 880’s shallow toe-box and tongue slide. If you’re shopping for Asics, then the Cumulus 19 is the Ghost equivalent. It has a comfortable dual-density ride, but with a shallow toe-box. The UnderArmour Gemini 3 is also comparable, but solely from a category perspective. The Speedform upper design and materials feel and fit different than the rest of the shoes on the list. Underneath, the Gemini 3 comes with a smooth and supportive ride. The Mizuno Wave Rider 20 has a ride quality which runs tangential to the rest of the pack, made unique by the hard plastic ‘Wave’ plate embedded in its midsole. And lastly, you have two of the most popular neutral trainers – the cushioned and responsive Pegasus 34, and the snappy Saucony Ride 10.